UK’s No.1 natural hair and beauty event sponsored by Azure Professional, Hairfinity, Colourful Radio, Curls, KeraCare and Design Essentials, Shea Moisture. Natural Hair Week UK returns for a second year, launched in 2013 it is the only event dedicated to informing, inspiring and interacting with women of colour nationally in the UK. Leeds, Manchester, Nottingham, Bristol, Birmingham and London. (Officially Natural) the events will be held between Saturday 28 June to Saturday 2 August 2014. Desmond Murray, Antonia Burrell & Shirley McDonald – recognised industry professionals with 70 year’s hair and beauty experience combined will deliver all seminars & hair demonstrations. Lush, UK’s favourite high street will provide product making workshops throughout each event. Attendees can also participate in the head wrapping cultural and fashion exploration workshops which will be delivered by Lorene Rhoomes, founder of Akhu Designs. 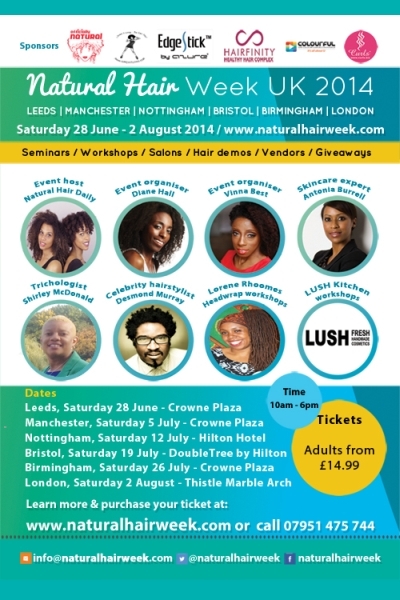 The competition to find the best UK Natural Hair Stylist 2014 will end on Thursday 31st July 2014. This year Natural Hair Week supports BME Cancer Voice, a UK charity supporting and campaigning for those with cancer in the BME community. Our commitment to unity in the promotion of natural hair health will only get stronger. Hair Week UK 2014 is set to be a sell out! For more information on Natural Hair Week UK, visit www.naturalhairweek.com.